Prep Time: 40 minutes (about 30 minutes hand-on time). 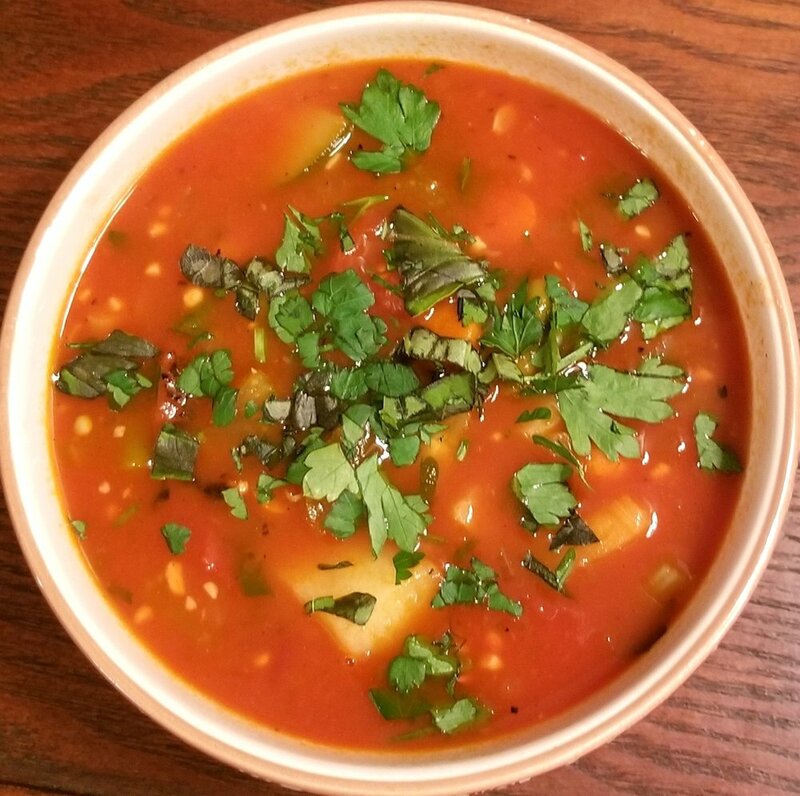 Meal Notes: This is my all-time favorite soup! It’s filling enough for a standalone meal, but also makes a great side. For lunches, I serve it with crackers and a cheese plate. For a slightly fancier dinner, I recommend pairing it with Baked Goat Cheese in Marinara (the easiest dip of all time) and a loaf of your favorite bakery bread. Source: Modified from the cookbook Delicious Soups: Fresh and Hearty Soups for Every Occasion by Belinda Williams. Prepare the ingredients: Dice the onion, zucchini, and celery. Peel and dice the carrot and potato. Mince the garlic. Drain and rinse the kidney beans. Trim the green beans, then chop them into bite-size pieces. Roughly chop a handful of basil and parsley. Cook the vegetables: Combine onion, garlic, zucchini, carrot, celery, and potato in a large pot. Add olive oil. Toss to coat. Cook over medium heat for 3-4 minutes. Simmer: Add the stock and chopped tomatoes, followed by the green beans and tomato paste. Mix everything together. Simmer for 15-20 minutes, or until the vegetables are tender. Season: Add the smoked paprika, kidney beans and balsamic vinegar, cooking long enough to heat the beans through. Season to taste with salt and pepper. Finish: Stir in the freshly chopped herbs before serving.